TRUE Frame/Chassis Mounted Tie Downs or Anchor Brackets are the best choice for securing your slide on truck camper. The patented design incorporates four independent tie down points that bolt directly to the truck frame to dramatically improve stability and handling. They are engineered to fit tight and secure to your truck frame with no loss of ground clearance. Most applications are no-drill. These tie downs are guaranteed to eliminate bed and bumper damage and come with our Legendary Lifetime Warranty. When used with any of our fully springloaded turnbuckles, we warranty the truck frame and camper anchor points for the extent of the manufacturer warranty. 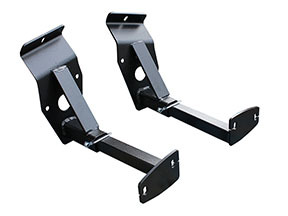 TRUE Frame or Chassis Mounted Tie Downs come in sets of two and are proudly made in the USA.